I have had my eye on this little box since the last time it was on sale in February. There was an article about how VMware made their ESXi Hypervisor software available for free. Being a fan of virtualization, I couldn’t wait to download and try this out. Unfortunately, ESXi is only supported on mainly high end servers with limited device driver support. 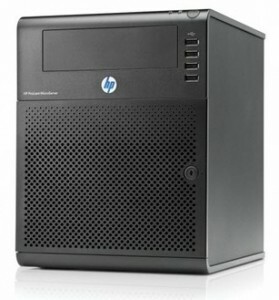 Although maybe not production capable, the HP N40L is an official ProLiant which uses all the supported server hardware. First thing I did was to install a Lite-On DVD burner and upgrade to 8gig ram, the maximum officially supported. Next, I took out the included 250gb Seagate which I will swap for the 1TB drive currently in my desktop PC. I also installed an old 80gb and 120gb drive to be used for virtual machines. HP included a bootable internal USB port, accessible right next to the drive bays. A nice feature as I can then install ESXi to a 2gb thumb drive (or other software like FreeNAS) keeping all hard drives available for data. My only complaint is VMware’s client software to manage the server is Windows only. A web interface exist, but it is not part of the free version. I don’t expect this to be a huge issue, being able to directly access the VM’s once built, but time will tell.